People love the opening titles of X-MEN:TAS. I even have a short chapter in the upcoming book about their creation. In the short time given Larry Houston and Will Meugniot (a few days?) to create the now-memorable opening sequence, Larry’s first storyboard pass was exciting, but it just wasn’t quite right. It, perhaps influenced by Stan Lee’s attempt at coming up with a titles narration, was far more focused on the plight of mutants as hunted creatures than on the X-Men as a team. The opening “Wanted Poster” image below was followed by police helicopter. Margaret Loesch wisely decided that we needed to focus more on our X-Men characters, so Will helped Larry re-focus the opening titles on our characters (many of whom were newer and less familiar to Stan). The first half of the 75-second sequence now became an exuberant introduction to the family of characters that we would be living with for five years, complete with their names in bold print. It worked. With the new images bonded with driving music, viewers felt the spirit of the series at the beginning of every episode. Between Larry, Will, and Margaret, they found the heart of X-MEN:TAS. DEATHSTRIKE IS DELIGHTED: @xmentas reaches 4000 followers! Yuriko is all up-in-arms over the fact that we have reached another Twitter milestone on @xmentas. 4000 followers. Real fans, no bots. Thanks again for your continued interest and for telling your friends about us. It seems we have established a basic pace — adding 1000 people about every month-and-a-half. We appreciate the response and will never take it for granted. As we look forward to the publication of the X-MEN:TAS book (currently set for mid-July, with 32 cast and crew interviews completed so far), a little teaser of a look ahead: There’s a sub-chapter about a controversy over Lady Deathstryke’s design. No spoilers. You’ll just have to guess for now. To quote Joe E. Brown from the movie Some Like it Hot: “Well, nobody’s perfect.” We had a tight schedule and a tighter budget on X-MEN:TAS. Some big animated series (at Disney, Warners, etc.) have the time and money to try all sorts of stories, develop them to script, see which ones everybody likes, then toss the ones they don’t. We didn’t have that luxury. The one-line ideas that were chosen were going to get made — we on the writing staff just had to make sure the 40-page scripts all came out well. Well, 76 out of 77 did. The one exception was a hard-edged episode set in rural Russia called “Bring Me Charles Xavier.” Many note-givers raised concerns early, at the premise and outline stages, like they are supposed to. But I liked the story and bull-headedly pushed it and the writer through to a couple of versions of the script — only to be told that no, many of my colleagues still didn’t like the story. So, after many weeks of trying, it was gone. I appologized to the writer, got him paid, and faced one of the heaviest repsonsibilities that the showrunner has in our corner of the business. Production needed a 40-page script to keep their schedule, so I wrote a completely new one over the weekend. Below are the would-be adversaries and the cast page from the abandoned script. Too bad : looks like it could have been fun. The first season of X-MEN:TAS we got away with something rarely seen in American animated television: we showed a continuing story set over 13 episodes. For us to be allowed to do this was a tough fight since every business interest invovled worried that delays unique to animation could make us miss our planned air dates. In the end they were right, and our connected storytelling cost them a lot of money. They made much more when the series became a hit, of course, but the damage had been done: no more connected stories. Occasional multi-parters might be okay (we pushed that hard), but episodes must STAND ALONE. Well, we cheated. We gave the network a two-part episode, then nine “stand alone” episodes, then a two-parter. The trick was that the final two-parter resolved a problem (Xavier and Magneto kidnaped together) that we had set up in the opening story, and the nine episodes in-between all “touched base” with the kidnaped characters. So to our audience, it felt like a continuing story. This continuing background “B story” seemed to knit it all together. I’m not sure what would have happened if the middle episodes had been shown out-of-order. Our theory was that they would still make sense that way. Perhaps we one day will make an experiment — starting with eps. 14/15 (“Till Death Do Us Part”), then mixing up episodes 16-24 at random, then concluding with the planned season finale of 25/26 (“Reunion”). Or maybe some fans could make a weekend of it and let us know the results. In any case, apologies to our network for bending the rules. But we like the results. When I mentioned yesterday how we had written out four team members from X-MEN:TAS and written in four new ones in what was to have been the series finale, I thought it would be just a fun note to fans. Then last night Julia told me: “People are guessing on Twitter. You have to tell!” Okay, fine. 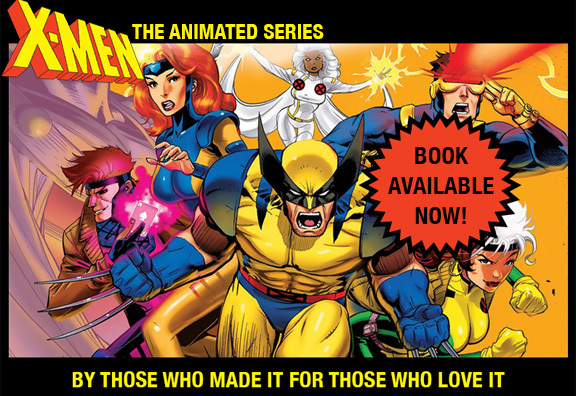 I was going to just wait and let folks read the retelling of the 10-page, 4-episode discarded premise in our “Making of X-MEN:TAS” book next year. But she’s right: I brought it up, I need to answer the question right away. First, who was to go. Jean and Scott, who we’d tried to marry off and get pregnant as early as episode 14 were now married and leaving to start a family. Makes sense. Xavier was leaving, in this case to take on a new set of much younger mutants (the at-the-time new “Generation X”). This is kind of like Vince Lombardi winning a couple of Super Bowls and deciding to go back to coaching highschool football, but there you are. Finally Storm decided that she too had other responsibilities. Bam. After an 88-minute, time-torturing, mega-villain-filled story, the X-Men are four folks short. Well, in our original story, we made Psylocke a major player, and she ended up asking to stay around (fitting in with some of the recent books). Same with Archangel. The two larger surprises were Bishop and Shard. The hard-fighting brother and sister from the future had become stranded in the present time (1996?). Since they too had proven themselves, the X-Men welcomed them. So there you have it — four out, four in. I have no idea how the delicate balance of our core team would have been affected. Making the new team work as well would have been a huge challenge. I’d like to think that if asked we could have risen to it. The production of X-MEN:TAS had to be patched-together to be able to happen. With sister series BATMAN:TAS, it was just: “Hey big studio Warner Brothers — you wanna do a Batman series? You do? Done.” Nothing so simple for X-Men. The TV network (Fox) wanted an animated X-Men even more than Batman. But they needed to find someone to take the risk and responsibility to produce it. Saban stepped forward — they knew how to market and package TV series, but they didn’t have a big production staff. Graz Entertainment was set up by veteran producers and crew to handle most of the art, design, and production supervision. A studio in Korea (AKOM) was chosen to do the hands-on animation work. Marvel Comics didn’t know TV production, but it was their property, so they were on-board as a partner. All this made for a VERY busy Christmas crew jacket handed out to many of us (see below) in 1993. I also believe, sadly, that the existence of this thrown-together partnership was the major reason that the series just kind of petered out. Warners (which owns DC comics) will always renew a Batman series in some form: they have a 100% interest in them. But Marvel and Fox and Saban and all the other X-Men partners that made our show happen ended up drifting on to other interests. Budgets dropped, episode orders dwindled, and we all found ourselves going our separate ways. Oh, well… still got the jackets.